Framing Hanley is bringing it. Oh yes! They certainly are! I’m not quite sure the best way of describing what “it” is, but they are bringing it, and they are bringing LOTS of it. However you care to define that copious amount of “it,” I can certainly tell you at least one thing about it: it’s good! It feels new. It feels old. It’s comfortable. It touches you. It changes you. Now, Framing Hanley aren’t reinventing the wheel with this latest, but they aren’t putting out the same old crap that every other band is serving up and trying to feed us either. 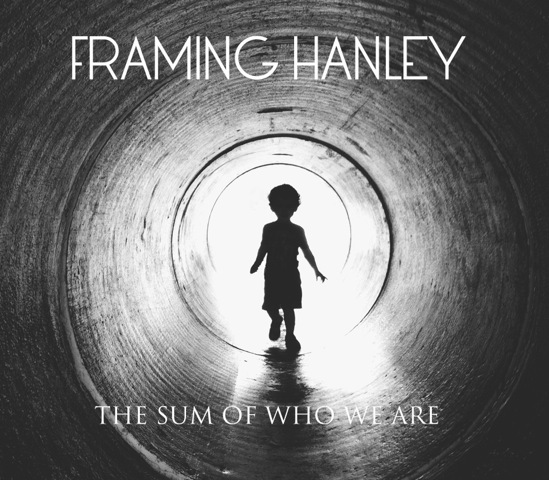 Framing Hanley brings the talent, the passion, and The Sum of Who We Are is the gift of the fusion of those elements. Right at the moment when you think to yourself, “I just heard this on the radio last week,” BAM! The songs change up, and becomes fresh and completely new. Each song on this album is like a journey, where the path is never circular, and you never see the same scenery twice (albeit similar). A solo guitar introduces “Collide,” a driving rhythm unfolding into the vocals that carry into the chorus, “I got where I want you now,” whilst once again toying with times and tempos. The song slides into and out of different layers and production effects; modern twists and electronic pops abound, all which enhance the framework. Nixon showcases vocal command, the occasional glissando and lyrical emotiveness. We find the first and only “harsh” song of the album with “Crooked Smiles.” Introducing a screamed vocal paired with a commercially palatable beat that will cause repletion amongst casual listeners, it provides an edge that makes it stand apart from other songs in this collection, yet remaining faithful to the Framing Hanley style. “Simple Life” arrives with a surprising electronic intro, an anthemic syrupy opener that drives into a neat groove. The heavier electronic effects are complimented by a modern flare, allowing the guitar solo to be more prominent in this song than on any other. The audible roller-coaster between the male/female vocal dichotomy accentuates the meaning behind the lyrics of “Rollercoaster“, permitting Framing Hanley to raise story-telling to a multi-sensorial level by allowing the lyrics to be heightened by the two extremes. The perky and vibratoless voice of Lindsey (Oh No Fiasco) aligns comfortably with Nixon’s as they bring us into their mini drama. “No Saving Me” continues that drama, with Nixon delving into the song through lyrics and , “I’ve become a shell of the man I was,” in self-reflection. Emotionally charged, the song effectively delivers us into the true ballad, “Unbreakable.” The tempos move around, but base around a 6/8 time signature, lilting its way through emotions lyrical declarations and explorations of heartfelt promises. The band changes up the pace with “Science” with a technically bubbly intro which stretches across a film of static, which moves through late 80s and early 90s planes. The song’s refrains and choruses are varied and intriguing, moving around between soft and whispering, melding with the guitar to the very end. “Streetlights and Silhouettes” beckons you to sing along and plead with Nixon for an angel, where “Crash and Burn” demonstrates the opposite, with a more upbeat tempo, that concludes with a choral delight. “Forever Till The End” declares that they will live forever, and the style of Framing Hanley is deeply appreciated and recalled. Arriving at the end, we savor the beauty and rawness of “Castaway,” with soft vocals and arpeggio strumming. The song builds momentum and we dive into the beautiful conclusion to the album, celebrating the overall achievement this album has taken us on. The album is solid – a little TOO solid. I personally love a little rawness. This record is polished. I’ve seen some of these songs delivered live, and they are even more fun and intriguing to watch as they are to appreciate on an album. Get the album, but DO get out there to a show, because the album is good, but the real deal is exponentially better: You hear, see, smell, and taste the sentiment, which you just don’t get from an album. The Sum Of Who We Are – 3.5 skulls! Framing Hanley is Currently on tour! Click HERE to Check Tour Dates!